A wide range of cutting discs for cutting steel, stainless steel, aluminium, metal and stone. 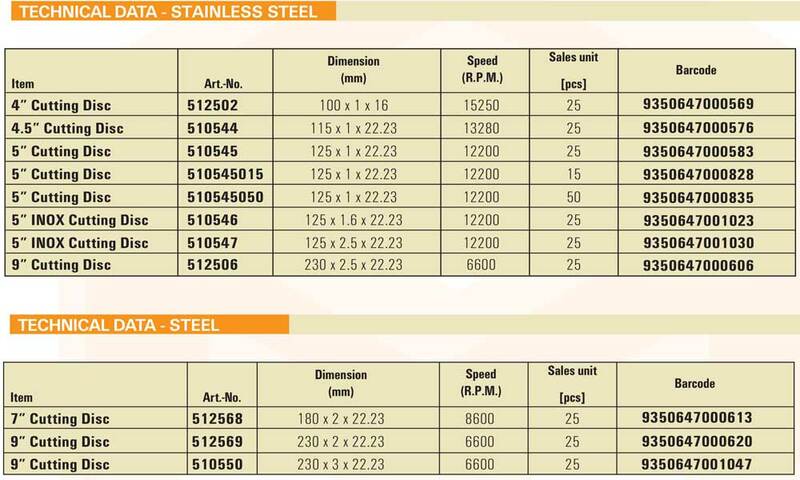 For cutting steel and stainless steel. The AnchorMark Grinding Discs have an efficient lifetime, as well as high stock removal. They are a versatile grinding disc of professional quality, with comfortable grinding performance and particularly suited for the treatment of hard steel materials. For grinding hard steel materials. For grinding aluminium an non – ferrous metals. For high quality grinding with minimal effort. AnchorMark Pty. Ltd., formerly known as fischer Australia, is an Australian owned and operated company established for the purpose of providing high quality products to the building, construction and metal industry at competitive prices. This website was programmed with utmost care. AnchorMark can nonetheless not vouch for the accuracy of the information provided. AnchorMark hereby precludes all liability for damage resulting directly or indirectly from use of this website, except in the case of wilful misconduct or gross negligence on the part of AnchorMark. A vast majority of our products are “Made in Germany” with stringent quality controls in accordance with the requirements of German/European international certification procedures.